So yes, maybe Papua New Guinea as opponents for an international friendly against the Philippine Azkals do not fall under the category fashionable. But Germany were in Poland, England in Estonia and Spain in Luxembourg. That an opponent willing and able was found, booked and shipped in, all inside one week, one must commend the Philippine Football Federation for its logistical savvy. At the very least, all the nervous energy that players invariably build up in anticipation of an impending match would be expended; and in a full FIFA international at that. Nothing brings more joy to a football player than the ball hitting the back of the net; and last night the Azkals made this happen five times. Despite the lowly ranking of 199 in the current FIFA Men’s Ranking table, PNG had all the potential to be the proverbial banana skin. 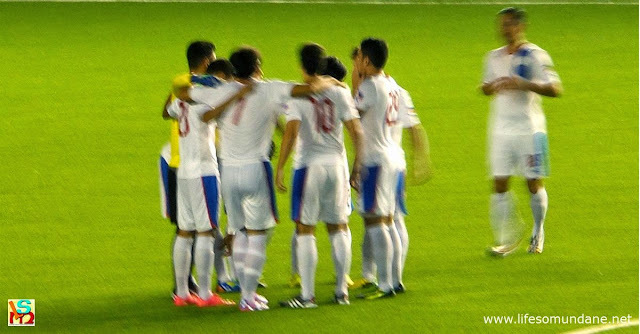 They had a narrow 1-2 loss to the Kiwis as recently as 2012 and only last month lost by the same score to Singapore. Of course, after 45 minutes the scoreboard read Mark Hartmann 4 Papua New Guinea 0. There would be no embarrassing slip-up. Phil Younghusband pitched in with a goal of his own, if just to break the monotony of the Hartmann show; but yes, he was put through clean on goal by a trademark Hartmann flick. It was the sort of goalscoring form that Hartmann has always promised as, indeed, he scores goals for fun in the UFL. The question now asked of him is if he can bring the same form against stingier defences. Last night was easy as PNG’s defence really laid out the welcome mat. Careless passes gave possession away in dangerous areas; and the open spaces in midfield were almost agricultural. The halftime score alone would have been far more emphatic had Younghusband and Patrick Reichelt had more composure when through on goal and were it not for a couple of mystifying calls. The Philippines failed to add to the goals scored in the first half, but this was largely due to the five changes made by Thomas Dooley at halftime, including handing a first cap to young Paolo Bugas. The changes in personnel meant that the team lost the fluidity of the first half. That said, Dooley managed to gain further insight about the depth of his squad by involving the fringe players and also tried to strengthen it just by giving these players playing time and, therefore, experience. Besides, the match was effectively won after the first half; and even a double-figure scoreline would not alter the state of the universe as far as the two teams were concerned. Although ultimately PNG were so poor that on last night’s form they were never going to be of benefit as an opponent to the Azkals as would a team of Malaysia’s quality, there will always be good reason to play teams of PNG’s stature in world football. First of all, PNG and other lowly ranked teams remind us of where we once were and where we do NOT wish to be anymore. By playing against them, we do the Good Samaritan’s work by giving them playing experience, the sort deprived our own players pre-Hanoi 2010. While playing against stronger teams is always good for keeping players physically and mentally sharp, against weaker teams a coach can also test his playing patterns. Thus, Dooley would have seen no waste in last night’s match. Finally, playing for the national team – or any team, for that matter – can be a stressful and frustrating experience; more so after losing two consecutive cup finals. Against PNG, the smiles were back among the Azkals. There was always going to be one winner last night; but playing against PNG was well worth the bother if nothing else but to restore the feel-good among the Azkals, something that all coaches know can never be understated.